The New York Knicks got crushed by the San Antonio Spurs at Madison Square Garden on Sunday, but just because the game wasn’t very entertaining doesn’t mean there was nothing going on in the stands. 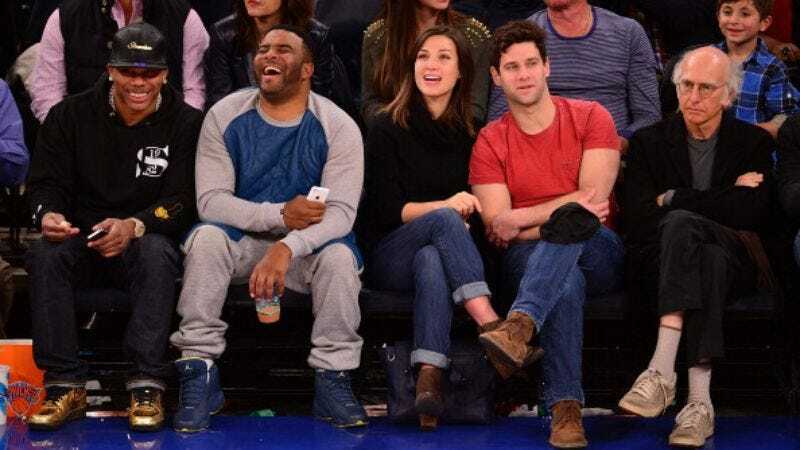 Sitting courtside were Nelly, Justin Bartha (National Treasure), and Larry David, the craziest east coast recreation of those times the Entourage guys were jockeying for Lakers tickets. The photo getting tossed around the Internet liberally is the one above, with David giving his best Curb Your Enthusiasm reaction to the events, from the crossed arms, to the frowning expression, to those socks. But For The Win dug up the other Getty photos from the night, of Larry smiling easily, and at least enduring the company of others in his courtside seat. It just goes to show that when the Knicks are playing terribly, the real story is the celebrities watching the game.